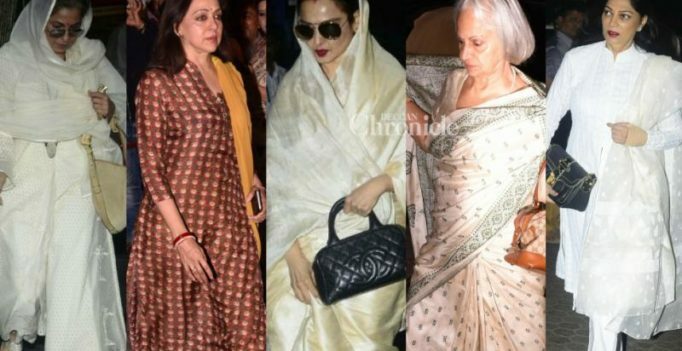 Mumbai: Several industry veterans, including leading ladies of Shashi Kapoor’s films such as Waheeda Rehman, Rekha and Hema Malini attended the prayer meet of the actor, here on Thurday. Shashi, 79, passed away on December 4 due to kidney problem. The actor’s ‘Chautha’ was held at Prithvi Theatre, which was built by him and his wife Jennifer Kapoor, in memory of his father, Prithviraj Kapoor. Waheeda, who worked with him in ‘Namak Halal’, ‘Kabhie Kabhie’, attended the prayer meet along with actors Rekha,who featured with Shashi Kapoor in ‘Silsila’ and was directed by him in ‘Utsav’, Malini, who co-starred with him in ‘Trishul’, ‘Kranti’ and his ‘Siddhartha’ co-star Simi Garewal. Apart from them, Poonam Dhillon, who worked with him in ‘Trishul’, Dimple Kapadia, who was directed by him in ‘Ajooba’, and ‘Satyam Shivam Sundaram’ co-star Padmini Kohlapuri attended the prayer meet. At the meet inside the theatre, they had a picture of Shashi around which people lit candles. 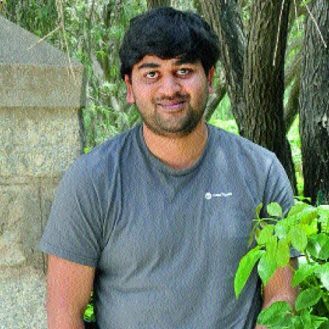 and behind the photo was a montage on screen playing his popular scenes. Guests paid their respects as his popular song ‘Ek Raasta Hai Zindagi’ played in the background. Members of Kapoor family, including Krishna Raj, Neetu, Randhir, Babita, Karisma, Rajeev, Armaan and Adar sat together. Apart from them, veterans from the industry were also present, including Gulzar, Kabir Bedi, Rakesh Roshan, Jitendra, Ramesh Sippy, Prem Chopra, Naseeruddin Shah, Ratna Pathak Shah, Subhash Ghai, Sanjay Khan and Asha Bhosle. Other guests included Rani Mukerji, Rohan Sippy, Milan Luthria, Chunkey Pandey, Nandita Das, Ahana Kumra, Kunal Kemmu, Soha Ali Khan, Ashutosh Gowariker, Kiran Rao, Abbas-Mastan, Suniel Shetty, Madhur Bhandarkar, Abhijat Joshi, Vidhu Vinod Chopra, Ronit Roy, Udit Narayan, Ramesh Taurani, Vipul Shah, Sonali Kulkarni, Hansal Mehta, Zoya Akhtar, Sudhir Mishra among others. Born on March 18, 1938, to the illustrious and formidable theatre and film actor Prithviraj Kapoor, Shashi Kapoor hit the spotlight at the age of four, acting in plays directed and produced by his father. He started acting in films as a child artiste in the late ’40s. His best known performances as a child actor were in ‘Aag’ (1948) and ‘Awaara’ (1951), where he played the younger version of the character played by Raj Kapoor. Shashi Kapoor also worked as assistant director in the ’50s. He made his debut as a leading man in the 1961 film ‘Dharmputra’ and went on to appear in more than 116 films during the ’70s and until the mid ’80s. Among his memorable films were ‘Deewaar’, ‘Kabhie Kabhie’, ‘Namak Halal’ and ‘Kaala Pathar’. He was honoured with the Padma Bhushan in 2011 and received cinema’s prestigious Dadasaheb Phalke award in 2015. Before opting for that new smartphone, always do a market research, check with your friends and make sure you go through the pointers given below….